Do not reply to this e-mail. Got news? Contact ePilot. Having difficulty using this service? Visit the ePilot Frequently Asked Questions now at AOPA Online or write to [email protected]. Technology has simplified many navigational chores for cross-country flying. Still, you must demonstrate your skill in the art of pilotage to earn a pilot certificate. More than ever before, showcasing your pilotage skills includes demonstrating that you always know your location relative to any restricted airspace or airspace requiring clearances or communication with air traffic control before entering. See the July 12, 2002, Training Tips "Avoiding Restricted Areas." As you practice pilotage-defined in Chapter 14 of the Pilot's Handbook of Aeronautical Knowledge as navigation by reference to landmarks or checkpoints-a small but valuable symbol on aeronautical sectional charts can help you be ready when your flight takes you near busier airspace. The symbol is known as a "visual checkpoint" (illustrated on page 16 of the Aeronautical Chart User's Guide, which you can download from AOPA Online). It consists of a pennant and the underlined name of the town, lake, or other landmark it represents. Scan your charts for visual checkpoints. You are bound to spot a few; for example, you can find them about 20 nm outside the center of any Class C airspace. They may be closely associated with information boxes on the chart instructing you to contact approach control within 20 miles on a designated frequency. They may also appear in other places where a prominent visual checkpoint is needed. 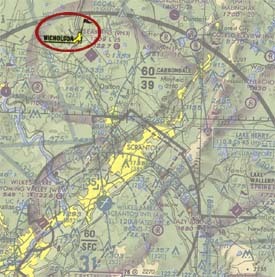 Airports make excellent visual checkpoints and are often designated as such on sectional charts. But use care: A tower-controlled airport (in Class D airspace) may be marked as a visual checkpoint for nearby Class C airspace. Make sure you contact that airport's control tower before entering the Class D airspace. If you are using GPS navigation as a backup, sectional charts now include "visual waypoints" that may be used in a similar fashion, as Jill W. Tallman explains in the January 2003 AOPA Flight Training. Good visual checkpoints, charted or not, have many uses. Note the most prominent landmarks near your home airport, measure their distance and bearing from the field, and use them to point the way home in reduced visibility or to decrease pilot workload. Your flight-test examiner is bound to notice your extra effort, too! Questions about the flight review continue to plague pilots. Simply put, you cannot act as pilot in command (even when solo) without a current sign-off for a flight review. Go to AOPA Online to learn more about the requirements and expectations for the flight review. You can also go to the AOPA Air Safety Foundation's Web site to download a free copy of ASF's Pilot's Guide to the Flight Review . Do you have a question? Call our experienced pilots-available weekdays between 8:30 a.m. and 6 p.m. Eastern toll-free at 800/872-2672. As an AOPA Flight Training Member, you have access to all of the features within AOPA Online. Login information is available online. The AOPA Air Safety Foundation has unleashed a powerful new tool to help pilots avoid runway incursions. In partnership with the FAA Office of Runway Safety and Operational Services, the all-new Runway Safety online course challenges pilots to reexamine how much they really know about ground operations. Using animation, video, challenging quizzes, and real-life examples, Runway Safety reminds pilots that they have to fly the plane from the time they start the engine until they shut it down again at their destination. Runway incursions occur when an aircraft, vehicle, or person creates a collision risk on an active runway. They are only recorded at towered fields but can technically happen at any airport. The New Piper Aircraft now offers Piper trainers with Avidyne FlightMax Entegra glass cockpits and will deliver 13 Warrior III aircraft to the University of Oklahoma next year, two of them equipped with Entegra displays. The system consists of two 10.4-inch (diagonal) displays, one showing flight and navigation instruments and the other showing the status of fuel and aircraft systems. Airlines are demanding pilot candidates who are trained in GPS navigation and glass cockpits, University of Oklahoma officials told New Piper President and CEO Chuck Suma. The Entegra system will be offered on the Warrior III, Archer III, and Arrow. It's already offered on the Saratoga II HP and II TC, and the Piper 6X and 6XT. The University of Tennessee Space Institute this fall is offering two short courses on stability and control flight testing and one on combustion instability. In the rotary- and fixed-wing stability and control flight-testing courses, students will conduct static and dynamic stability testing in the lateral and longitudinal axes and maneuvering stability testing. Enrollees in the fixed-wing course who are certificated pilots will be able to take spin demonstration flights in a Cessna 150. The university also will use its Piper Navajo and Saratoga, and Bell OH58 A+ Kiowa. The combustion instability course centers on the theory of combustion instability and how to implement it in the design process. Each course includes a series of ground lectures. For more information, contact Becky Stines, director of the department of continuing education, 931/393-7276, or visit the Web site. California's San Jose State University is closing its aeronautical laboratory and phasing out its aircraft maintenance degree program because it is losing its space at Norman Y. Mineta San Jose International Airport. San Jose is the only public school in California to offer bachelor of science degrees in aviation maintenance management, operations, aviation management, and avionics. But with the phase-out of the airport facility, the university is turning the program away from hands-on experience and FAA maintenance certification. Aviation students from the school alerted AOPA President Phil Boyer to the downsizing of the program during an AOPA Pilot Town Meeting last month in Santa Rosa. Boyer has written letters to California Gov. Arnold Schwarzenegger and other legislative and educational leaders, urging them to support the program. See AOPA Online. The AOPA Legal Services Plan, one of the top services that AOPA offers exclusively to its members, has the highest participation ever. The plan does much more than offer legal help in the event of an FAA enforcement action. Under the plan, members can receive reviews for aircraft rental, leaseback, hangar, and tiedown agreements and obtain legal advice on aircraft purchases or sales. The cost is only $26 for private and student pilots. To learn more, see AOPA Online or call 800/872-2672. HAVE YOU UPDATED YOUR AOPA MEMBER PROFILE? To make the most of your membership and allow us to serve you better, please visit AOPA Online and update your personal member profile. The folks at CheckMate Aviation say the idea for the FlyWrite writing pad was born after watching CFIs and student pilots jotting down notes on anything that happened to be handy-up to and including gum wrappers. The FlyWrite is an "in the cockpit" pad designed to give you one place to note radio frequencies, clearances, wind directions, traffic pattern altitudes, ATIS and AWOS reports, Hobbs and tach times, and all the other bits of information you might need to record during a flight. The 5-by-8-inch pad contains 50 sheets and comes with an extra-heavy cardboard backing that provides a firm writing surface. The FlyWrite pad costs $4.50 and can be ordered online. Question: What is a through-the-fence operator at an airport? Answer: There are instances when the owner of a public airport permits access to the public landing area by independent operators offering an aeronautical activity or by aircraft based on land adjacent to, but not a part of, the airport property. This type of arrangement is commonly called a through-the-fence operation. Through-the-fence operations include businesses or individuals who have access to the airport infrastructure from outside airport property, or who utilize airport property to conduct a business, but do not rent business space at the airport. Common types of through-the-fence agreements are freelance flight instruction, aircraft maintenance, and aircraft hangars. For more information, see AOPA Online. Got a question for our technical services staff? E-mail to [email protected] or call the Pilot Information Center, 800/872-2672. Don't forget the online archive of "Final Exam" questions and answers, searchable by keyword or topic. The AOPA Online Gallery allows you to download your favorite images to use for wallpaper, send a personalized e-card, and order high-quality prints to be shipped directly to your doorstep. Search the hundreds of fabulous images in our archives and select your favorites today! For more details, see AOPA Online. Need a medical certificate? Our database of aviation medical examiners (AMEs) has been updated. See AOPA Online. See the current weather on AOPA Online, provided by Meteorlogix. Belleville, Michigan. Thunder Over Michigan 2004 takes place August 7 and 8 at Willow Run (YIP). Contact the Yankee Air Museum, 734/483-4030 or visit the Web site. Mayville, New York. An Ultralight and Sport Airplane Fly-in takes place August 14 at Dart Airport and Aviation Museum (D79). Fun, flying, refreshments, and free admission to the aviation museum. Rain date is August 15. Contact Bob or Greg Dart, 716/753-2160. Alliance, Ohio. The Sixth Annual Ohio Aeronca Aviators Fly-in takes place August 13 through 15 at Barber (2D1). Breakfast served Saturday and Sunday from 7 to 11 a.m. by EAA Chapter 82. Primitive camping on field, local lodging available. All are welcome. Contact Brian Matz, 216/337-5643, or visit the Web site. McCall, Idaho. The Eighteenth Annual Northwest Mountain McCall Family Fly-in takes place August 13 through 15 at McCall Municipal (MYL). Seminars, tours, static displays, flybys, and the FAA Wings and PACE programs are just some of the planned attractions. Contact Frank Lester, 208/334-8775, or visit the Web site. To submit an event to the calendar or to search all events visit AOPA Online. For airport details, see AOPA's Airport Directory Online . The next AOPA Air Safety Foundation Flight Instructor Refresher Clinics are scheduled in Allentown, Pennsylvania, and Fort Worth, Texas, August 14 and 15. A clinic is also scheduled in Reno, Nevada, August 21 and 22. For a complete schedule, see AOPA Online. Can't make it in person? Sign up for the CFI Renewal Online. The next Pinch-Hitter® Ground School will take place in Fort Worth, Texas, August 15. For more Pinch-Hitter courses, see AOPA Online. AOPA Air Safety Foundation Safety Seminars are scheduled in Little Rock, Arkansas, and Eden Prairie, Minnesota, August 9; Rogers, Arkansas, and Des Moines, Iowa, August 10; Omaha, Nebraska, and Oklahoma City, August 11; and Wichita, Kansas, August 12. The topic is GPS: Beyond "Direct-To." For complete details on topics and schedules, see AOPA Online. Got news or questions? Send your comments to [email protected]. Changing mailing or e-mail addresses? Do not reply to this automated message • click here to update. To UNSUBSCRIBE: Do not reply to this automated message • click here. To SUBSCRIBE: visit AOPA Online.